To make your yard a bee-friendly place, there are several things you can do. 1. Most importantly, do not use pesticides in your yard. Find organic alternatives to using chemical sprays. Also, some products such as Bayer's All-in-One Rose and Flower Care contain a harmful insecticide along with a fungicide and fertilizer. These products should be avoided; they are not bee-friendly because the main ingredient, Imidacloprid, is in the neonicotinoid class of chemicals which has been shown to be highly toxic to bees. The insecticide is taken up into the plant and remains in the leaves, pollen and nectar, reaching lethal concentrations. Read more at the Xerces Society: http://www.xerces.org/neonicotinoids-and-bees/. Bees are harmed by these insecticides that are not intended for them. Please email me with your specific pest problems and I will provide you with organic alternatives. 2. Add some bee-friendly plants to your garden. Both honeybees and many native bees such as bumblebees like flowers that are yellow, purple, white, and blue. Some good choices for the San Francisco Bay area are lavender, yarrow, rosemary, aster, lupine, oregano, butterfly bush, butterfly weed, borage, bee balm, sunflowers, sweet alyssum, alstroemeria, lion's tail, salvia, blanket flower, coneflower and pincushion flower. Bees also like the flowers of many vegetable plants, such as broccoli so you can let a few of them "go to seed" so the bees can enjoy them. Also, planting a variety of nectar and pollen sources that bloom throughout the seasons will help attract bees to your yard. 3. Provide shelter for native bees such as bumblebees. Many nest in the ground or in wood snags. Leave some undisturbed areas in your garden for potential nesting sites. A garden that is too "clean" will not be as attractive to native bees, whose numbers are in drastic decline due to habitat loss. 4. Foraging bees of all kinds need shelter from the elements. Keep wide expanses of grass or concrete to a minimum. 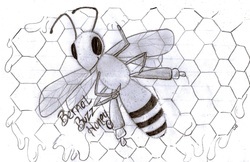 Bees need plants of all kinds for protection from the elements such as wind and rain.